The architecture of the BeyondTrust application environment relies on the BeyondTrust Appliance as a centralized routing point for all communications between application components. All BeyondTrust sessions between users and remote systems occur through the server components that run on the appliance. To protect the security of the data in transit, BeyondTrust uses 256-bit Advanced Encryption Standard (AES) SSL to encrypt all application communications. BeyondTrust's architecture offers customers the ability to choose how and where the appliance is deployed. Additionally, customers may configure the security features such that the BeyondTrust deployment complies with applicable corporate policies or regulations. Security features include role-based access control and secure password requirements. 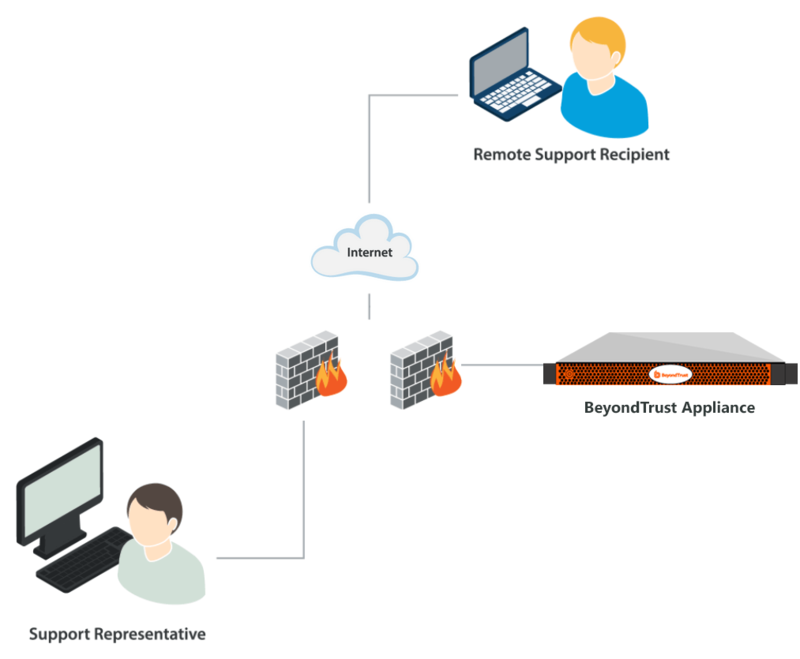 BeyondTrust enables remote control by creating a remote outbound connection from the endpoint system to the BeyondTrust Appliance through firewalls. For BeyondTrust to provide remote control securely, the appliance is designed to use the most common network infrastructure or architecture that supports internet-accessible applications – a demilitarized zone (DMZ) with firewall protection. The BeyondTrust Appliance is designed and tested to ensure it works properly and securely in internet environments. While the appliance can be deployed internal or external to your organization, to achieve optimal security, BeyondTrust recommends that you place the BeyondTrust Appliance inside the DMZ, as illustrated. This diagram shows the recommended configuration for one BeyondTrust Appliance.